As you all know I absolutely love my home Lucerne and Swiss chocolate. I even love the latter that much that I have to tell everybody I meet during my travels that Swiss chocolate is way better than theirs (P.S: wherever you are from, Swiss chocolate is better! :D). So it would definitely be amazing if there would be chocolate from Lucerne itself – wait, there actually is chocolate with milk from Lucerne. The Swiss chocolate company “Villars-Maitre-Chocolatier”, which is based in Fribourg, created a new range of chocolate called “Terroirs de Lait” which includes three different chocolates with milk from the regions Fribourg, Bern, and Lucerne. What was especially interesting about this for me was that the chocolates are actually produced only with milk from the specific region. They all have completely different tastes, which really surprised me. But before I tell you a bit more about how I actually liked the chocolate, let’s explore Lucerne together! On the picture, you can see the most famous place of Lucerne – the old wooden bridge (Kapellbrücke) with the stunning view on the peak of Mount Pilatus. I’ve actually been there hundreds of times – and still can’t get enough of this view. To me, this is one of the most beautiful views in whole Switzerland – at least if you’re lucky and have a clear view. What’s actually interesting about that is, that the milk used for the Lucerne Villars Chocolate is from cows from exactly this mountain. They live in the beautiful Swiss Alps with fresh air, and believe me, some breathtaking views are always included there. Mount Pilatus is kind of the backyard mountain of Lucerne and it makes the chocolate really authentic to me. Now it’s time to cross one of the busiest places in Lucerne: The Chapel Bridge we saw in the picture before. To take a picture without a tourist there is almost impossible, and sometimes you might feel like you landed in a huge metropole (fun fact: Lucerne has under 100’000 inhabitants!). 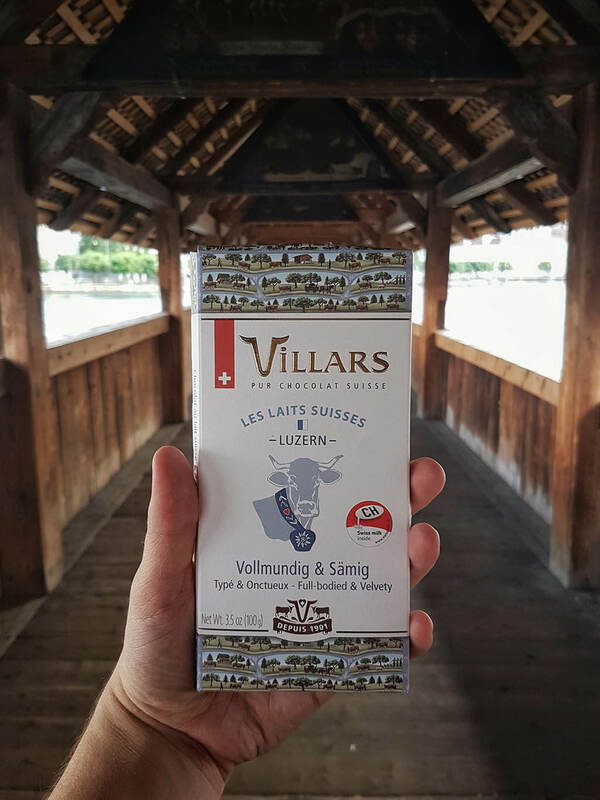 The chapel bridge was built in the early 14th century and reconstructed after it burnt down in 1993 – whereas Villars chocolate is producing its chocolate for over 100 years (founded in 1901). So far everything sounds great – also the package of the chocolate looks like a high-quality product. But how does it actually taste? Isn’t this what actually matters the most about chocolate? Well, it is! While I absolutely love the idea and mentality of the new product range by Villars I have to tell you: the chocolate is even better than that! The Lucerne chocolate is described as “full-bodied & Velvety” and hands down, it is one of the best chocolates I’ve ever tried so far – and I can highly recommend it to every chocolate lover. 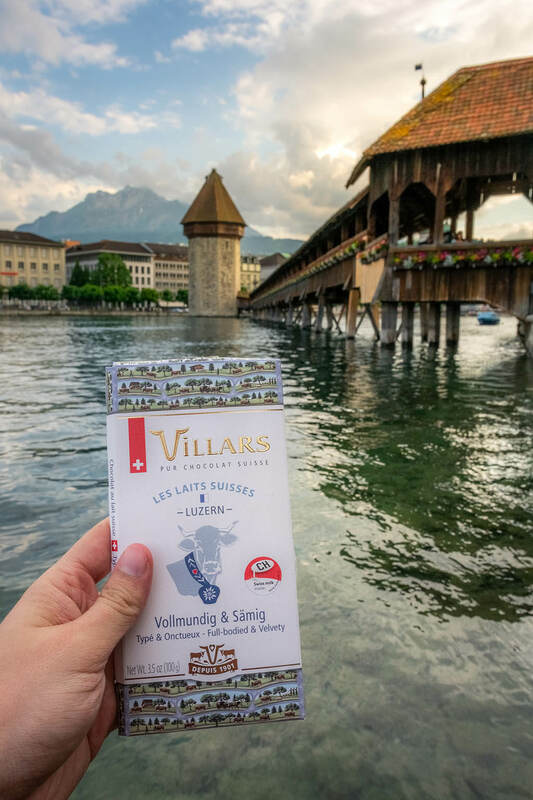 If you are looking for an authentic Swiss chocolate, Villars is a fantastic option, as they produce their chocolate 100% in Switzerland. You can see their Terroirs de Lait collection on their website and directly order it from there.